The probate of the will dated 16th January 1850 of John Mellers Coal master of Hucknall Under Huthwaite 7th April 1851, “left his stock in trade book and other rights, shares and interests in railways collieries steam engines colliery implements coal mines minerals ores etc to his son Samuel Mellers”. He also mentioned a grandson John William Calladine Mellers. 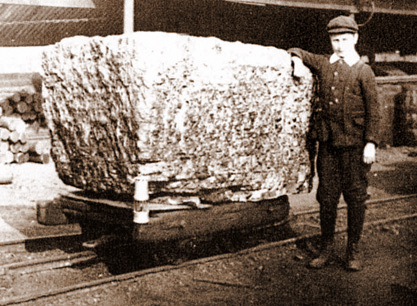 In 1851 in honour of the Great Exhibition of that year a large lump of coal weighing several tons was sent to the exhibition from the Speedwell colliery (Richard Barrow) near Staveley to promote British coal. A method known as ‘wax walls’ was implemented in Derbyshire. This was a system of inserting clay around wastes, to prevent underground heatings by sealing off oxygen in the air from the old works. In certain pits the small coal in the waste or gobbing could fire by spontaneous combustion. Later sand walls would be built instead to starve the areas of oxygen. In Nottinghamshire, pillars of coal left for the support of important buildings etc were referred to as ‘posts’. Thomas North and Co sank Babbington No3 shaft at Hempshill for his Cinderhill mine (Nottinghamshire). It was an upcast shaft 9 feet (2.74m) dia constructed of firebrick and 236 yards (216m) deep. No coals were drawn at this shaft that had a horse gin at the surface. It was connected to a brick cupola 20 feet (6m) high and the return air from the Bulwell drift and the topside workings passed over a furnace which was 9 feet (2.74m) wide and had 9 feet (2.74m) long bars with 3 boiler fires. The shaft bottom was a barrel shape and had a travelling road. It was found that the Top Hard was almost the same level as the Top Hard position at the other side of the great fault so an idea to connect the two began to emerge. Exhibition (Butterley Co) sunk to Kilburn at 230 yards (210m) opened, named after the Great Exhibition of 1851, and would connect with New Main workings in Low Main and Blackshale. Ventilation was effected by a furnace underground. (Top Cloddy pit lay to the south) (Derbyshire). Hockersley, (North West Derbyshire) to First seam (Red Ash). Reservoir (or Cut End colliery) (Moira Colliery Co) (Leicestershire) was sunk to Main coal at 221 yards (67.2m) and opened with a banquet for 450 men and boys and a 21 gun salute. Underwood sinking (Nottinghamshire) (Barber and Walker) to Top Hard. Tapton and Lockoford and Ingmanwell, (Derbyshire) Blackshale and ironstone worked for £80 per acre, John Ashton, Surveyor June 1851. Thornsett Hey (SF Hiddrington) (North West Derbyshire), sunk to Yard seam 1851, to be worked by Jon Jowett, coal belonging to Duchy of Lancaster. Newhall Field Colliery (Moses Cartwright) was taken over by Robinson and Forman. By 1855 around 200 men and boys would be employed. The Cotes Park Estate was the property of John H Barker Esq in the Township of Alfreton, Surveyor Charles Robertson, Doncaster. Barker colliery Deep Soft coal pit sunk. A pillar would be left for the Midland Railway tunnel. A heavy emission of gas from the floor exploded at the furnace at Shipley (Mundy). It was deemed to have happened because no dumb drift was provided and all the return air in the mine had to pass over the furnace. Charles Morton in his first Mine Inspector’s Report 1851 noted that in the Midlands, illegal ‘Davy’ type lamps were being used and others were being improperly repaired and used and obviously failed to be effective against an explosion. At many of the pits where the lamp was necessary, it was only used as an experiment and trial and quite frankly was hated by many miners on account of its very low and feeble illumination, and sometimes the men were tempted to remove the safety gauze to get a better light, irrespective of the possibility of causing an explosion that could have been fatal to themselves or others working nearby. The cost of a Davy lamp was 7s 0d (35p), a Clanny lamp which gave only half the light but had glass round the flame cost 12s 0d (60p) and another design, a Biram lamp that gave light in one direction only cost 7s 6d (37½p). ‘Recording of deaths in mining began to be listed’ and throughout the country there were 984 fatal accidents. Secretary of State Sir George Grey Bart MP 1851-1852. 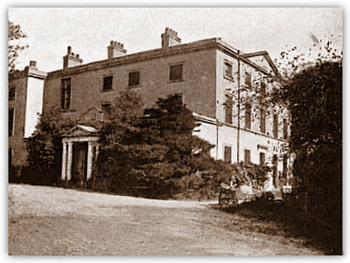 Thomas North leased Basford Hall in 1851 from Francis Wakefield who in turn had leased it from Thomas W Edge who had purchased the Hall from Sam Hall about 1840. The miners at Butterley Park mine averaged around 15 shillings (75p) a week over the year - no more than they had earned in the 1790s.By 1851, John Smith, colliery Agent for the Butterley Co’s Butterley Park colliery had worked for the firm for 42 years, firstly as a collier then as an official. Thomas J Taylor was a Viewer in the area. Watnall Hard (Barber and Walker) coal pit, Lady Day 1849 to Lady Day 1851. The term ‘fast end’ was referred to. Dronfield, George Earnshaw aged 14 was killed on 5th May 1851 when a large quantity of coal fell upon him when one of the supports gave way. Clay Cross (Clay Cross Co), Joseph Clark, explosion of firedamp 5 Aug 1851. Codnor Park, William Hoole aged 11 fell down the 170 yards deep shaft on 25th Jan 1851. He was employed at the pit with his uncles but on turning up for work on that morning was told to go home several times but he stayed in the cabin until 9am. At this time one of the men was to enter the pit and the deceased ran out of the cabin towards the chair but fell underneath it and down the shaft. Codnor Park, George Wagstaffe aged 28 was killed on 28th Feb 1851 whilst he was sinking a shaft. Having prepared a blast he called to be drawn up the shaft to a place of safety and then got out of the trunk and called the banksman to hold up. The trunk was drawn up and Wagstaffe fell to the bottom and shortly after the blast went off. Langton (Coke and Co), Francis Lee (16), collier was holeing under the coal when a large lump weighing about 9 cwt fell from the side and he was found to be dead when his body was recovered, 1 Apr 1851. Langton (Coke and Co), Sam Elliott (26) fall of roof 10 Dec 1851. Pinxton (Coke and Co), John Bryan (12) and his brother were assisting their father Matthew Bryan and his job was to pull trucks of coal off the bridge tree and assisted by his brother take them to a place to be emptied and then bring the trucks back to the pit mouth, ready to be sent back down the pit. On this occasion he was in the act of pulling an empty truck towards the shaft when the hook on the truck slipped and he fell backwards down the 150 yards (137m) deep shaft and was found to be dead. He had been cautioned several times before not to pull the waggons with his back to the shaft. However he chose to ignore the advice as that method he employed was easier. Unfortunately his brother was pushing the waggon from the other side but no blame was apportioned to him, 1 Jul 1851. Pye Hill (Jas Oakes), Wm Smith (?) fall of roof 12 Aug 1851. Shipley (Mundy), John Davis and Christopher Newton, explosion of firedamp 8 Aug 1851. Swanwick (Morewood) James England (?) hit by iron bar 20 Oct 1851. Tapton (J Clayton) Christopher Butcher, fall of coal 10 Oct 1851. Turkey Field (Thomas North), Francis Wilson (62) employed to clean the roadways was killed by a fall of bine or bind roof weighing between 10 and 12 cwt, 8 Oct 1851. Watnall (Barber Walker), Edward Cooke (boy) fall of roof 28 Sep 1851. January 2 boys Edwin Jessop and James Thompson were killed when they fell down the shaft during a shaft sinking. Skegby colliery (Dodsley), on Monday 24 Feb 1851 as the miners were going to work at about 5am there was an explosion of firedamp and George Bradder junior of Hucknall under Huthwaite and Thomas Bettison of Spring Wood were both burnt. Again this showed that over the weekends when no coal turning was done methane gas collected in the working places. The Cromford Canal was sold in 1851 to the Manchester, Buxton and Midlands Junction Railway. The executors of Turner’s will formed the Swanwick Colliery Co and Anthony Tissington who had managed Turner’s pits was appointed as General Manager. He resided at Swanwick Hall that had been built in 1690. The Morewoods then purchased the pits. There was an old pit sunk to Top Hard. The 1851 Census in Clay Cross found that boys of 8 and 9 years old were still being employed underground illegally by unscrupulous owners who had little regard for their workforce. As can be seen there were insufficient Inspectors to travel the country to ensure that the 1842 Act was being adhered to.